What Does a Groin Pull Feel Like? What's the Treatment for a Groin Pull? When a Groin Pull Feels Better, What Then? How Can I Prevent Groin Pulls? A groin pull -- or groin strain -- results from putting too much stress on muscles in your groin and thigh. If these muscles are tensed too forcefully or too suddenly, they can get over-stretched or torn. Groin pulls are common in people who play sports that require a lot of running and jumping. In particular, suddenly jumping or changing direction is a likely cause. 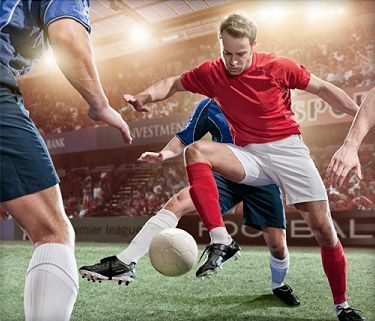 Groin pulls often appear in people who play soccer and football, and they make up about 10% of all injuries in professional hockey players. To diagnose a groin pull, your doctor will give you a thorough physical exam. Tests like X-rays and MRIs (magnetic resonance imaging) may be needed to rule out other problems. Ice the inside of your thigh to reduce pain and swelling. Experts recommend doing it for 20 to 30 minutes every 3 to 4 hours for 2 to 3 days, or until the pain is gone. Compress your thigh using an elastic bandage or tape. Take anti-inflammatory painkillers. Nonsteroidal anti-inflammatory drugs (NSAIDs), like ibuprofen and naproxen, will help with pain and swelling. But studies show their effects are controversial especially if taken long-term. Additionally, these drugs can have side effects; they should be used only occasionally unless your doctor specifically says otherwise. To assist tissue healing, your medical provider will guide you in active stretching and strengthening exercises. Depending on grade of injury, this can start immediately or may require several days of rest. Pain is used as a guide. Too aggressive and further damage may occur. Most of the time, these conservative treatments will do the trick. But not always. If these techniques still don't help, you may want to think about surgery. While surgery may give you relief, it's a last resort. Not everyone can return to their previous level of activity afterward. So talk over the pros and cons of surgery with your doctor. You should also consider getting a second opinion. Everyone wants to know how quickly they can get back in the game after a groin pull -- and how soon the pain will go away. But there's no easy answer. Recovery time depends on how serious your groin pull is. It may take four to six weeks, but that's just a rough estimate. People heal at different rates. In the meantime, switch to a new activity that won't put too much stress on your groin muscles. For instance, runners could try swimming. If you start pushing yourself before your groin pull is healed, you could re-injure yourself. And if you get further groin pulls, they may be harder to treat and take longer to heal. They can even lead to permanent disability. Always warm up your legs and groin muscles before physical activity. A light jog or other activities to increase body temperature have been shown to reduce risk of muscle stains. Wear shoes with good support that fit well. Always increase the intensity of your physical activity slowly -- no more than a 10% increase a week. Stop exercising if you feel pain or tightness in your groin or the inside of your thigh. Do regular strengthening exercises for your thigh muscles, especially if you've had a groin pull before. Groin injuries can result from added stress due to weakness elsewhere. If involved you're in athletics and you have a history of groin injuries, ask your medical professional about activities that can help reduce your risk. American Academy of Orthopedic Surgeons web site: "Muscle Strains in the Thigh." Anderson, K., et al, American Journal of Sports Medicine, July/August, 2001. Davis, M.F., et al, Expert Guide to Sports Medicine, American College of Physicians Press, 2005. Nicholas, S.J. and Tyler, T.F., Sports Medicine, 2002. Rouzier, P., The Sports Medicine Patient Advisor, second edition, SportsMed Press, 2004.